Jessica McCoy is a recipe developer and food and travel writer. She blogs at All She Cooks, where she offers readers tasty recipes, travel stories, and 52 Weeks of No-Repeat Meal Plans. The Shore in New Jersey is a place of many sights, sounds and smells. From the Victorian-era homes in Cape May, to lighthouses, boardwalks and scents of carnival fun, to the miles upon 217 miles of sandy beaches. Smack dab between Pennsylvania and New York, and referred to by many as a suburb to Philadelphia and New York City, the Jersey Shore is a playground for many vacationers. While the beaches are relaxing and fun for adults and children alike, there is more to do on the Jersey Shore than what you might typically imagine. Take an afternoon break from building sandcastles, playing in the surf, and throwing money away on carnival games that few ever win. Enjoy a New Jersey that locals to the Shore are familiar with, and a past time that is as common here as casting a rod and reel. To some families vacationing on the Jersey Shore, crabbing is a ritual they look forward to each and every year. 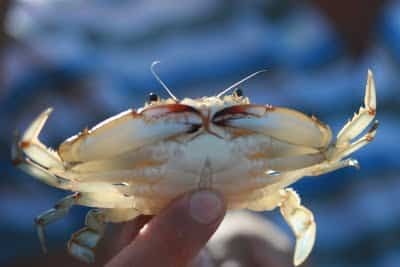 It's something they pass on to their children, and crabbing stories are swapped like fishing stories as grandfathers tell their grand-kids how it used to be done by flashlight at night. 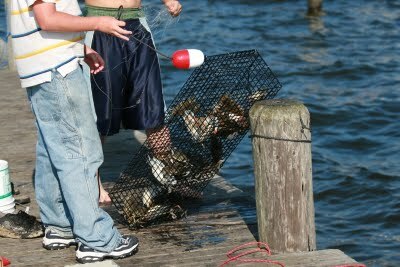 A crab trap, chicken pieces, a bucket and some string are the only tools required, which makes crabbing an inexpensive and relaxing past time. 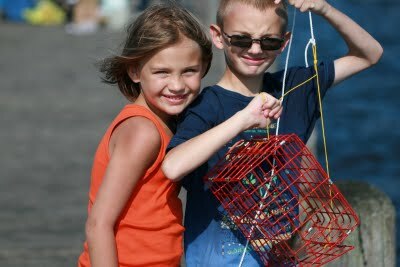 While my family lived in New Jersey, we would often take our son to Seaside Heights to go crabbing. We've been back on vacation a couple times since, and each time, going crabbing is one of the things on our must do list. If you've been to Seaside Heights, you'll know it's best known for the boardwalk, amusement parks, and of course the beach. Take a short walk to the bay side of the Seaside Heights, and you'll find a few scattered tackle and bait shops and several fishing piers at your disposal. For less than $20.00 you can purchase a trap and other necessary supplies that will have you completely decked out for an afternoon of fun. You can catch and release, or catch and cook. Just make sure to pick up a current brochure from one of the bait shops and follow crabbing guidelines. Crabbing for blue crabs on the bay side of the Jersey Shore (or in the Hudson River, I've heard) is great fun for families with kids. We've taken our kids since our son was just a baby, whenever we can get back to New Jersey. Thank you so much for sharing, Jessica! I love this piece & found it to be perfect timing as we were considering trying our hand at crabbing for the first time while at the beach this week. ;) Make sure you stop by Jessica's blog and peruse all of her wonderful recipes!